UCL Postgrads – Are you interested in making connections with local communities? Thinking about volunteering? Want to collaborate with people outside of academia? 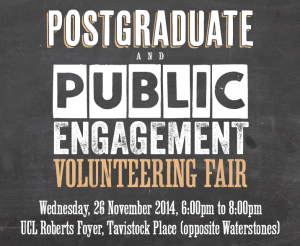 If so, come and have some stimulating discussions at our Postgraduate Volunteering & Public Engagement Fair. 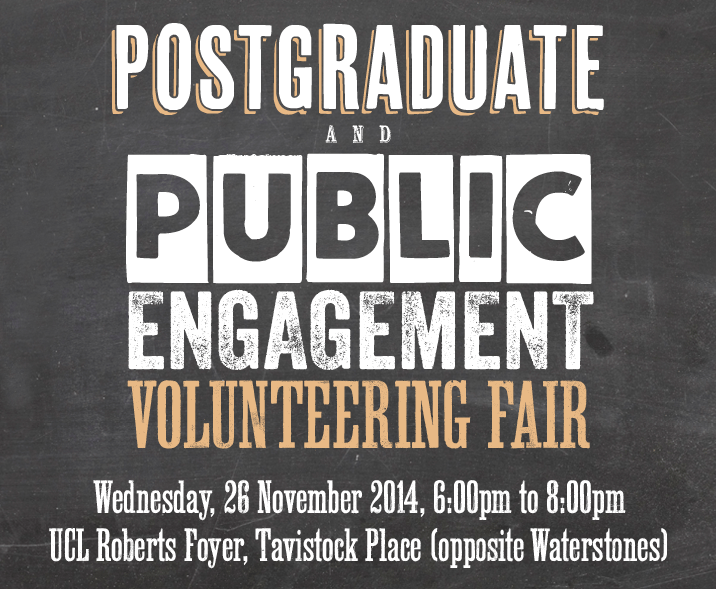 There will be thirty stalls to browse, and staff from across UCL and UCLU to give advice about volunteering and public engagement. Oh, and we’ll have refreshments too. Exhibitors include Access Sport, Body & Soul, Carnaval del Pueblo, Doorstep Library Network, Endometriosis UK, Family Mosaic, Future Frontiers, IntoUniversity, Noah’s Ark Children’s Hospice, North London Cares , Real Action, Royal Mencap Society, Sova Support Link, The Camden Society, UCL Grand Challenges and more. The event is jointly organised by UCL Public Engagement Unit, UCLU’s Volunteering Services Unit, and the UCLU Postgraduate Association.